Just in time before the 2012 Olympics kicks off in London, Jordan Brand will be releasing one of their featured shoes related to this year’s London Games. Hitting shelves next week, July 19, is “USA” edition of the Air Jordan 2012 Lite, which is expected to get a lot of attention. 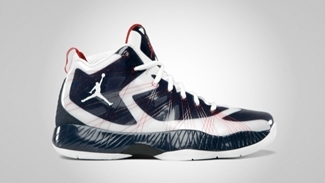 The lighter version of the Air Jordan 2012, Jordan Brand’s banner shoe for this year, features Flywire throughout the shoe and carries White, Obsidian and Gym Red colorways, which is the team color of USA in the 2012 London Games. This is expected to be a hot commodity next week so make sure to grab one immediately.